Born in Montreal in 1928, John Nesbitt was originally trained as a cabinet maker. After the tragic death of his first wife during childbirth, he turned to art for solace. 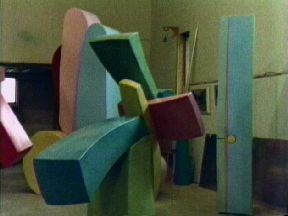 By the 1960's he had achieved prominent reputation for his abstract metal sculptures. He then stayed in New York City for the next ten years. Since the mid 1970's John Nesbitt and his wife Ann Richardson, have made the coast of rural Cape Breton Island in Nova Scotia their home. With this move came a rejection of the New York art establishment. As Nesbitt notes it is what you do in your studio, rather than in the galleries that ultimately makes you a great artist. For him there is no separation between life and work. The film captures both the poetic and the technical aspects of the creative process. We see what it means to be an artist who needs the beauty and the quiet isolation of Cape Breton Island to create huge sculptures of brightly colored metal and smaller works of metal and stone. In contrast to this is the harsh realities of the business of art, where ultimately it is the dealers who have the real power to get your work seen and sold. John Nesbitt died in 2002. The film has aired nationally on CBC TV. "This videotape reaches far below the surface of a typical artist's biography to evaluate and compare the environment's effect upon a man's life work. 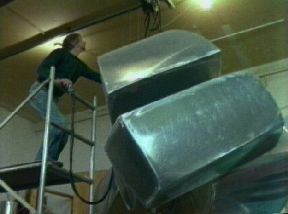 Nesbitt, through his words and work, presents his viewers with his notions about art, the environment and audiences - which he prefers to be children. "This is a beautifully produced and presented biography that should appeal to secondary and college students. It has special appeal in that it addresses sculpture, an art form that is woefully under-experienced at all levels of instruction. It is far from the how-to-do-it types that currently clutter the catalogues and shelves." – - School Arts Magazine, April, 1990.